Earlier this summer I set about making a tomato water and bacon chawan mushi. The first time I tried it, the egg curdled a bit and I set about trying to figure out what happened. Enter Ideas in Food, a cooking blog blending science, technique and some inventive ideas. Browsing the archives I found this article on using brussels sprouts stalks like bones, scooping out the tender marrow within. 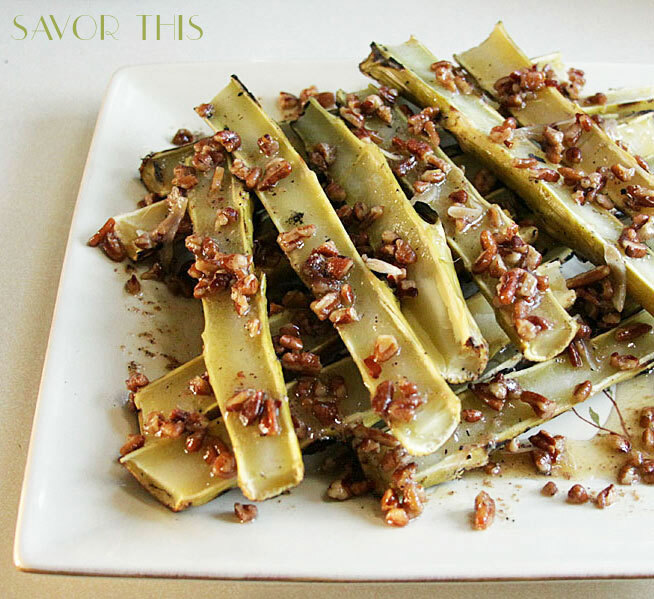 I knew instantly I’d be trying this with my broccoli stalks come summer’s end. And here we are. WIth only a few tiny florets left here and there, it seemed time to dig those suckers up. We also had been invited to a lobster dinner with a request to bring a side dish. If these worked, I thought they’d not only be great flavor-wise, but would be an impressive presentation and topic of conversation. So I headed outside and pulled, twisted and yanked and ended up with a good pile of stalks. 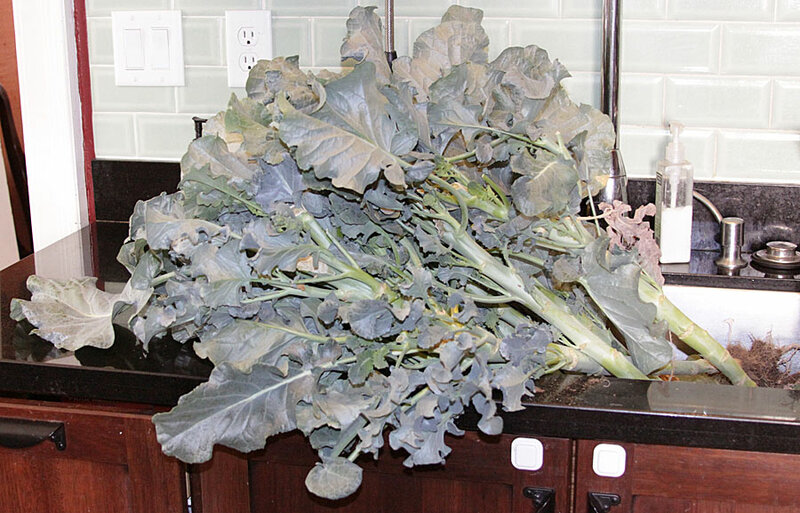 I decided I would throw them into our giant sink, cut off any remaining florets, pass along the tender, baby leaves to my mom, and cut the stalks into pieces. Once I had the haul in the sink, I realized I probably should have done the dirty work outside. Soon the counter and floor were crawling with tiny spiders, dusted with dirt and things were, in general, a big mess. And it was about to get a whole lot messier. I grabbed a stalk, I removed the florets and leaves with a chef’s knife, then transferred it to a cutting board. A hearty whack with the knife got me no further than about a millimeter and the serrated bread knife just got stuck. So I brought out the big guns: my dad’s meat cleaver and rubber mallet. I covered the root ends with a kitchen towel and whack whack whacked all those suckers into 6-8″ pieces. When they were done, I put them in a steamer to cook for about 40 minutes. We then heated the grill and Ryan charred the outside while I made a pecan, garlic butter to drizzle on top. Once they had cooled I was able to use the chef’s knife to split them in half. A few of them were still a little too hard to open so I set them aside thinking I could cook them a little longer later because we had an enormous pile already. We drizzled them with the butter and set them out for everyone thinking you could scoop the innards out with a spoon. But as we were about to eat a pile of lobsters like savages, the consensus was to just pick them up and scrape the marrow out with our teeth. This was a little tricky once you got to the middles so I would probably cut them a little shorter next time. But since we were already covered in butter and lobster juice, it was hardly tragic. One person said they tasted like an new sort of artichoke or perhaps just an intensified broccoli. I think the sweet pecans and nutty butter really helped bring out that flavor. The texture was soft, but still toothsome and I think they could easily have cooked more turning into an almost butter of sorts like when you slow cook broccoli to that magic place. All in all an inventive, fun and delectable dish made all the more exciting in its rarity. 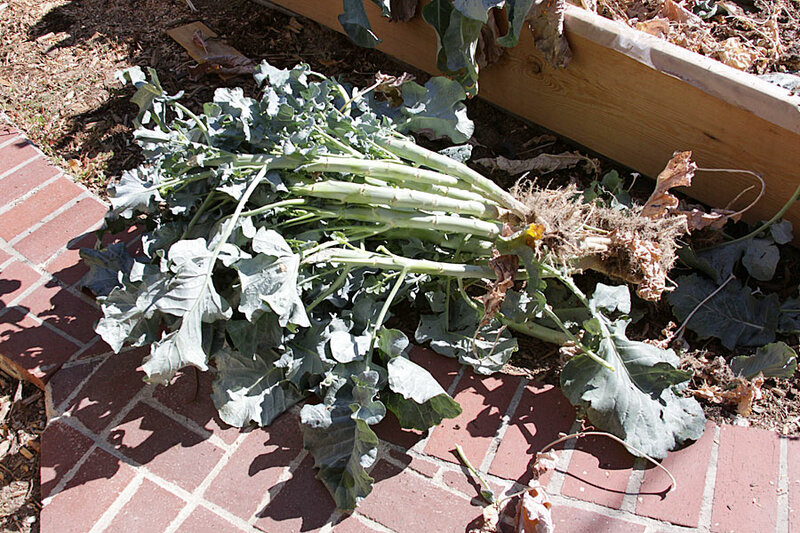 Trim all leaves from the broccoli stalks. Being very careful, whack the root end with a cleaver. I found it easiest to gently whack the cleaver into the stalk and then hit it with a rubber mallet to get through the stalk. 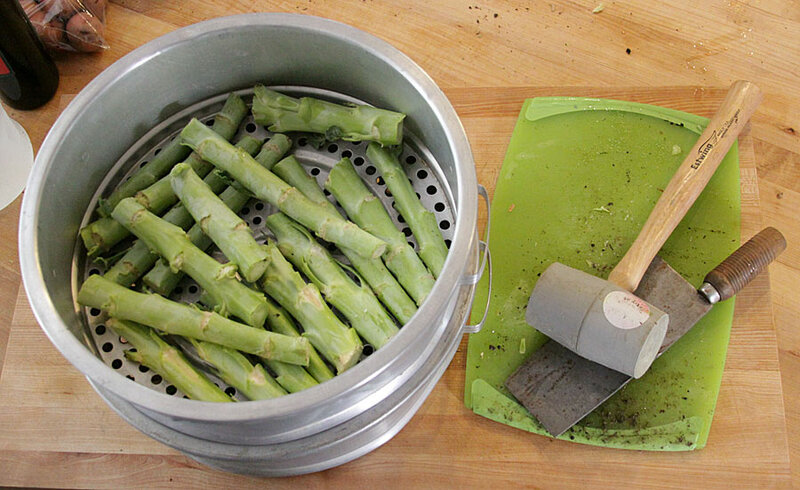 Do the same to cut the stalks into 4-5″ lengths. 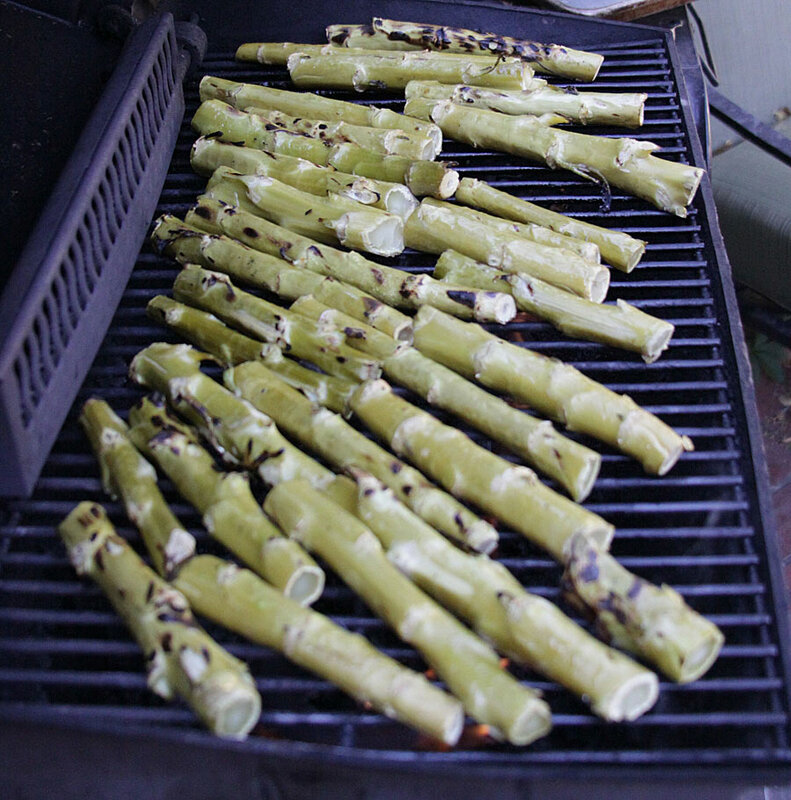 Place stalks in a steamer and steam for about 40 minutes. You might want to test one to see what the texture is like. Once done, lightly oil and char on a grill for about 10-15 minutes. Allow to cool, cut in half and plate. Melt butter in a pot, add pecans and stir for a couple minutes. Add garlic and red pepper flakes and simmer gently until the garlic edges begin to crisp, but not quite brown. Stir in lemon juice and season with salt and pepper. Pour over stalks and eat immediately. If needed, you could reheat briefly in the microwave or oven to ensure the butter is still melted. This entry was posted in Vegetarian by Marina Chotzinoff. Bookmark the permalink.